Nothing to keep us in Karavos, so we slipped our moorings and headed off towards Stila, an island 15 miles along the coast. 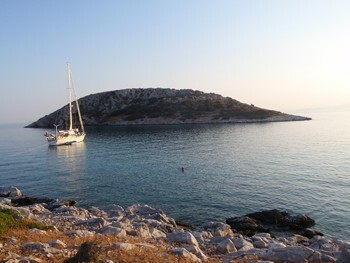 Very little wind so we motored most of the way and dropped anchor behind a little islet Ay Andreas,off Stila. It was sheltered, but a current seemed to swirl around in there and the boat started to turn through 360 degrees, so we moved position and took a line ashore. This was much better and once the boat was settled and tidied, we went for a swim in the very clear water. The only other boat in the bay was a fishing boat, and that left soon after, leaving us all alone. Bliss! Off Stila Island - peace and quiet. 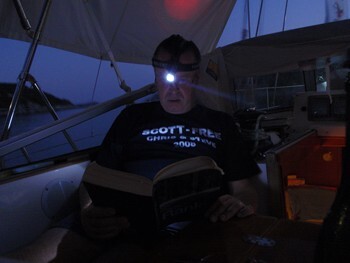 Reading by torchlight!